The environment where you workout matters. 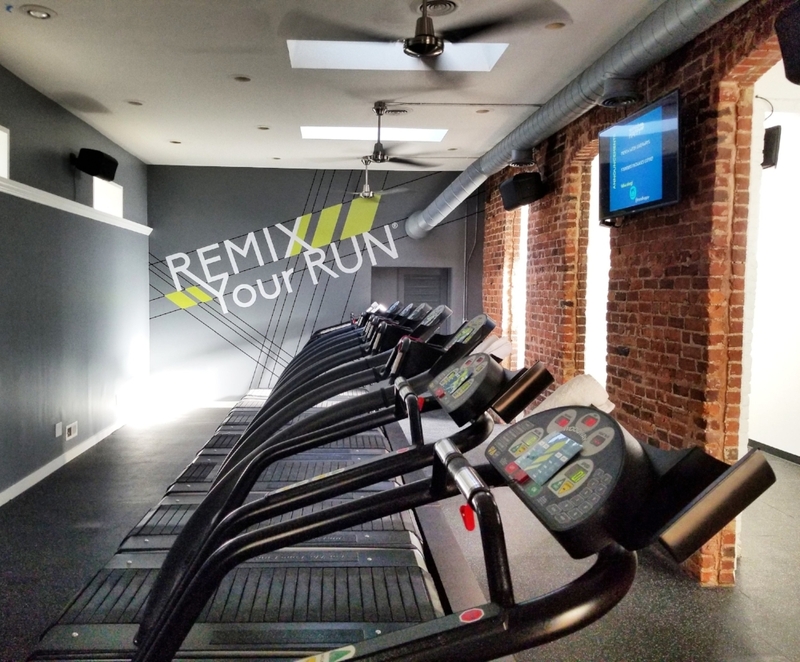 As the only group running studio in the mid-Atlantic and South East, our run studios in Virginia - Charlottesville & Richmond - and North Carolina - Charlotte - were custom designed to motivate. tread HAPPY Charlottesville is set in a renovated 70-year old auto service center. The building (yes we have our own stand alone building!) is truly a one-of-a kind space in Charlottesville: high ceilings, soothing colors, and large windows bringing in natural light will help energize you to make the most of each and every workout. In fact, research suggests that exercising in natural light can promote significant health and performance benefits and make you feel, well, HAPPIER. The studio is small enough to offer personalized coaching but large enough to accommodate groups of 10 to 20 comfortably. This flagship studio serves as our laboratory as we continuously consult with faculty and physicians to hone our programming. tread HAPPY Richmond is set in one of the oldest buildings in The Fan district. The space, what was once an old carriage house, is complete with tin ceiling, exposed brick, and wood floors. The studio is large enough to accommodate larger classes or even 2 classes simultaneously. The studio includes a large lobby area complete with juice/coffee bar area with Snowing on Space nitro coffee and Blue Ridge Bucha kombucha on tap. It's perfectly set up for private classes, bRUNches, and events - email us with any/all ideas and chances are we can make it happen! Our newest studio in the Queen City has allowed us to bring that swag farther south to Charlotte, NC! Beat bumpin', feet flyin' in the sweetest studio space right off the light rail in the Historic South End. Making your tread n' shred dreams come true with top-of-the-line Woodway treads & sweet fully stocked weight stations. Expect all your fave classes, including our signature run-specific classes, & the same workout all driven by the beat of the music, which has become our namesake. Enjoy Updog Kombucha and Pure Intentions cold brew coffee on tap after class or shop our bespoke tread-branded retail. Find us at 128 Park Ave. Walk, run, bike, scooter, take the rail, or drive (we will have ample parking), just be ready to Remix Your Run® in the Queen City. All of our classes alternate between aerobic and/or anaerobic intervals on the treadmill and body-weight resistance training segments on the floor. We have high-end commercial treadmills. In Charlottesville we offer a choice between running on top-of-the line Woodway and LifeFitness treadmills. In Richmond and Charlotte, we exclusively offer Woodway treadmills. The treads allow us to incorporate consistent, authentic, and effective cardiovascular exercise into our classes (whether through walking, jogging, or running). If the treadmill isn't for you or if you're recovering from an injury, we also have a Keiser M5 Strider, an easy to use elliptical machine that offers an effective lower-impact cardiovascular workout. You can reserve this machine ahead of time for the class you'd like to take. In addition to the tread, we offer set stations of equipment including plyometric platforms, dumbbells of varying weights, and several types of resistance bands. We also use Trigger Point brand foam rollers to help you promote greater range of motion via myofascial release.